Conversation touches on Hebrew parallelism, marriage, and the making of many books. I often say to my students that poetry is about things that matter. In his new poetry collection John Leax (pronounced leks) seeks to push aside the artificial boundaries that limit the subject matter for poetry. Tabloid News is a humorous collection of 14 poems—two to four pages each—inspired by actual headlines from supermarket tabloids. Leax has shifted his "willing suspension of disbelief" into high gear and has put cotton into his ears so he won't notice how high it's still revving. With such titles as "Baby Born with Antlers" and "Montana Police Shoot Bigfoot" he has permitted himself to think, "Suppose one could believe the tabloid headlines." So how can such zany romps be about anything that matters? In his preface Leax outlines the limitations he placed on himself for the project, the most significant of which was his exploration of "What desire, what fear is represented" by the chosen headline. It all began with the whimsical poem "Leaping Turtles Invade US". A friend of the poet recognized in it a response to the horrors of 9/11 which John Leax had himself not noticed. his own that something was awfully wrong? make the ape–child beautiful … ?" This is not the first time a significant Christian poet has taken on similar material. Jeanne Murray Walker's book Coming Into History (Cleveland, 1990) has a section inspired by provocative headlines. One notable difference in approach, though, is that Leax is less concerned with artistically wrapping the character in metaphoric language than with simply capturing the hilarity, the humanity, and the wonder of the situation. But in order to wonder, there must be room for possible belief. 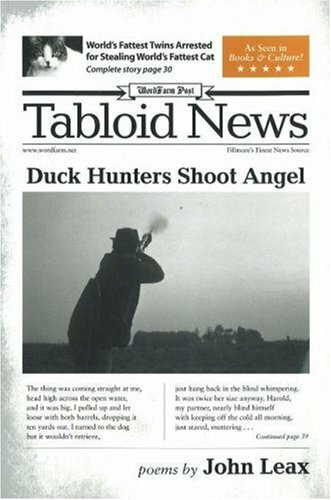 In "Duck Hunters Shoot Angel," the story is told by the one who supposedly pulled the trigger, as though he were leaning on a coffee–stained counter in a donut shop; his choice of words is raw with vulgarity, grammatical slips, and images he would believably use, including saying the angel had "an arm muscled like Hulk Hogan." Others in the story make amusing comments that sound like they could have really been said in the situation. The hunter's companion asks early on, "'Ya think it's in season?'" The Baptist preacher who arrives with the sheriff says, "'That's an angel all right. Biggest one / I ever saw.'" And the sheriff tells him "he couldn't see / I'd broken any laws. Angels ain't / protected or anything." So often poets stumble over humor, but Leax has hit it head on with all the subtlety of a twelve–gauge. Along with the delicious absurdities of "one million turtles / possessing the reported temperament of killer bees" or a being that is half man and half pig, he plants puns for the literary–minded. In "Bat Boy Is Missing," for example: "He is not Robin, no good fellow / sidekick, puckish accomplice / of a comic book hero." Even in Leax's earlier, more conventional, poetry he has dug into unusual soil. The title poem of his book The Task of Adam (Zondervan,1985), for example, is about a dictionary left open to the page where the words Troposphere, Trotsky, Troubadour, Trousers, Trousseau, Trout, Trowel, and Truckle appear. Is it any wonder that this same poet has been prompted by tabloid headlines? So how can these poems be about something that matters? John Leax has directed us, using the traditionally high–brow art of poetry, to examine the humanity behind the low–brow headlines of the tabloids. Reading the Tabloid News, we experience the shock of recognition: we see ourselves, our common lot, laid bare. Copyright © 2005 Christianity Today. Click for reprint information. Tabloid News: Poems is available from Amazon.com and other book retailers. Excerpts and more information are available from WordFarm. For book lovers, our 2005 CT book awards are available online, along with our book awards for 2004, 2003, 2002, 2001, 2000, 1999, 1998, and 1997, as well as our Books of the Twentieth Century. For other coverage or reviews, see our Books archive and the weekly Books & Culture Corner.